Beneath a frozen surface, stirrings. Out on the tundra, ecologist Donatella Zona and her colleagues often think of home. “But we can’t go home,” she said. 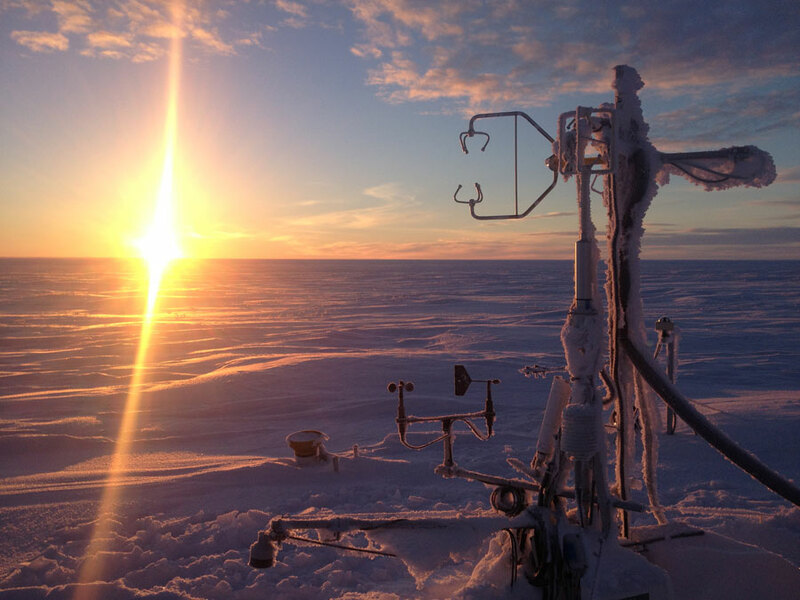 “We need to make measurements year round.” Summer on Alaska’s North Slope is quite pleasant. In the winter though, the scientists hunker down at their research site, where average temperatures drop to -18 degrees Fahrenheit. Most of the time, they futz with wires, calibrate instruments, and check sensor deicers—all to detect faint wisps of methane seeping from the freezing soil. 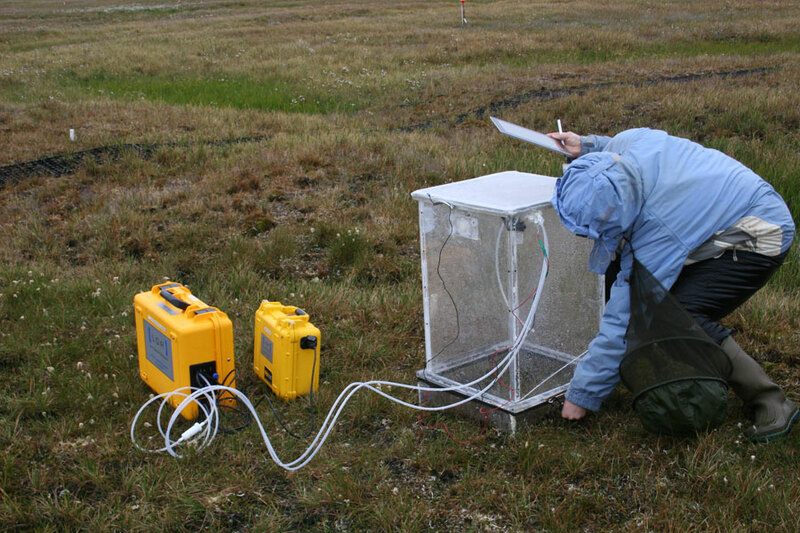 While many researchers study summer methane released by Arctic wetlands to predict future greenhouse gas emissions, Zona and her colleagues suspected cold season emissions are equally important to Earth’s changing climate, if not more. Methane is an extremely potent greenhouse gas. Over 100 years, each molecule of methane (CH4) impacts Earth’s climate 28 times more than each molecule of carbon dioxide (CO2). Human-related sources like livestock farming and fossil fuel production account for 64 percent of Earth’s methane emissions. The rest comes from natural sources, mostly from wetlands and in smaller amounts from termites, oceans, and volcanoes. In the Arctic, methane bubbles up out of lakes, ponds, and swamps. Microbes at the bottom of these environments scarf down decayed matter that have sunk from the surface. In the process, these microbes use up oxygen. Methane-producing microbes love oxygen-poor environments and take over these bodies of water. Scientists think wetlands are the most dominant oxygen-poor environments in the Arctic and therefore the largest methane sources. So they map these wetlands and use them as a proxy for tallying the Arctic’s year-round methane budget. These maps are often based on measurements made in the summer, when wetlands in the Arctic have thawed out. From June 2013 to January 2015, the scientists took turns spending months at the Barrow Environmental Observatory, a cluster of labs at Alaska’s northernmost point and about 1,300 miles south of the North Pole. The observatory lies a few miles from Barrow (population 4,300), which is accessible only by plane. In the evenings, the scientists bunked in sparsely furnished Quonset huts. In the daytime, they watched over five instrument towers equipped with methane-sniffing sensors. Sometimes they had to traverse boardwalks built over the tundra to check on instruments; other times they took planes to get to the towers which are spread out along a 186-mile transect line. In the summers, the researchers swatted mosquitos and trudged on tundra as mushy as porridge. Summer also brought that singular tundra smell, faintly reminiscent of lavender flowers. In the autumn, winter, and spring, what the researchers consider the cold season, they gingerly walked on tundra alternately soft, crusty, or frozen stiff. The tundra’s top layer, called the active layer, thaws in the summer and freezes in winter, unlike the permafrost underneath that stays frozen all year. 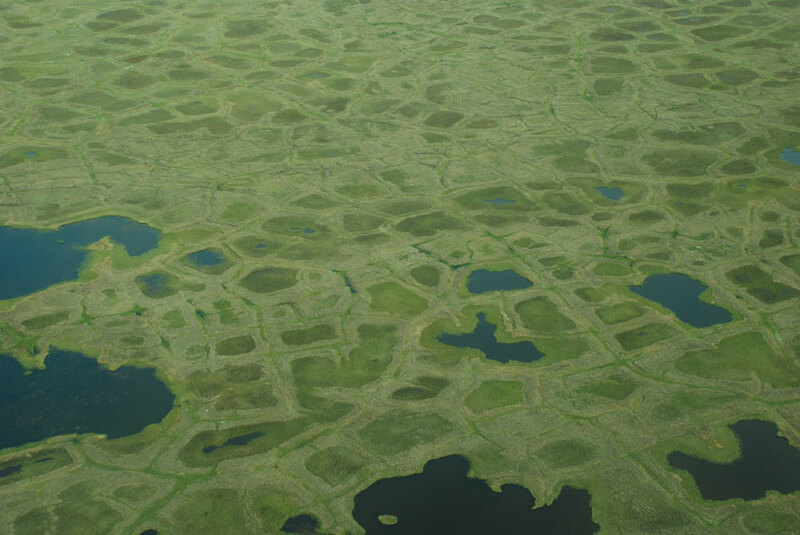 While Zona’s team only saw flat or hilly landscapes with squat vegetation, their colleagues in NASA's Carbon in Arctic Reservoirs Vulnerability Experiment (CARVE) viewed the tundra’s unique features from the sky. On a C-23 Sherpa aircraft, the CARVE researchers gazed at a landscape pockmarked by elongated thaw lakes and polygon shapes patterned by wedges of ice, typical of land underlain by permafrost. As the tundra cycled twice through summer, fall, winter, and spring, the aircraft flew over the transect fifteen times, measuring methane with a payload of sensors similar to those that Zona’s team tended to on the ground. Was there methane out on the freezing tundra? Could methane-producing microbes even survive the frigid Arctic winter? After collecting data for two years, instruments on the ground and in the air agreed: methane emissions during the cold season accounted for more than 50 percent of the total annual methane emissions. This contradicts what computer models assume, that the Arctic’s largest methane emissions come from wetlands, and only happen in the summer. The findings could call for big changes in the way scientists collect data on methane emissions. “We need to consider the cold period to arrive at an accurate budget of Arctic methane emissions during the entire year,” Zona said. Indeed, methane rises from the tundra in the winter, and the researchers traced it to unexpected stirrings within the active layer. Zona first saw the first hints in the tower and aircraft data. Most of the cold season methane emissions happened during what scientists call the zero curtain period, when soil temperatures in the active layer lingered near freezing. This happens when the active layer’s middle section remains thawed, favoring the activity of methane-producing microbes. Cold, winter air may freeze the active layer’s surface. Permafrost may cool the bottom. However, the middle could remain thawed well into the winter. To test this idea, Zona and her colleagues drove metal rods through the frozen tundra surfaces. The rods pierced the active layer without resistance, but stopped at the layer of hard permafrost. Curiously, soil temperature remains stable during the zero curtain period, keeping methane-producing microbes active. 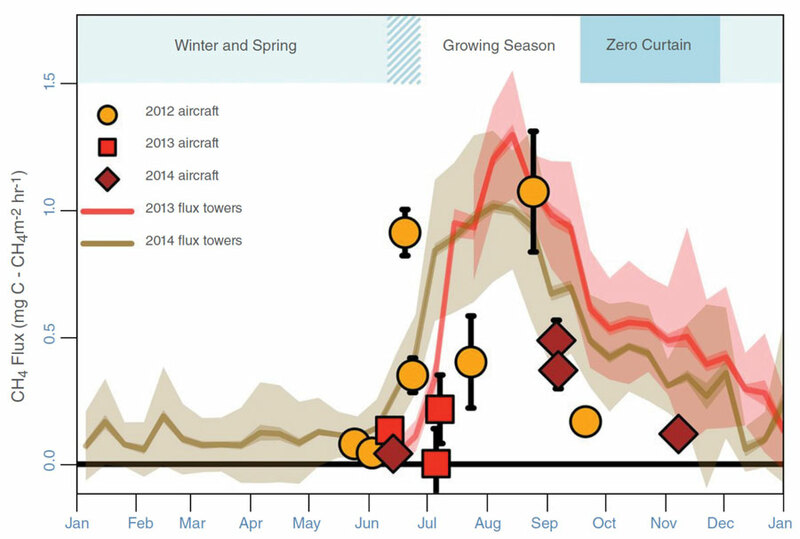 In some sites, the researchers found that the zero curtain period stretched longer than summer, implying an extended period of methane emissions. “We were surprised to see how long it takes for the soil to freeze completely, and how the persistence of this unfrozen soil maintained substantial methane emissions well into the winter,” Zona said. In some instances, thick snow cover insulated the active layer, extending the zero curtain period and enhancing emissions. The finding has huge implications for the Arctic’s methane budget. Recent studies forecast that continued warming will bring deeper snow to the Arctic, and already, regions north of the Arctic Circle are warming twice as fast as the rest of the Northern Hemisphere. Zona’s findings also suggest that Arctic methane emissions could be more sensitive to climate change than scientists previously thought, as winter is warming faster than summer, potentially delaying the freezing of the tundra. The Intergovernmental Panel on Climate Change projections do not even include greenhouse gas emissions from summer wetlands and from thawing Arctic permafrost. And Zona’s findings highlight the relevance of Arctic methane emissions. More years of data on cold season emissions would solidify these findings. Back at Barrow, the researchers prepare for another season on the Alaskan tundra. The two years of observations have led to other questions and a stronger conviction that cold season emissions matter. Zona’s students are observing Arctic plants that seem to act like chimneys, drawing methane from the not quite frozen active layer and ushering the gas out into the atmosphere. It means more missed holidays and racing to get work done between long and dark polar nights. It also means the shimmery treat of seeing the occasional aurora borealis. “There are so many open questions,” Zona said, not without a hint of excitement. Zona, D., et al. 2016. Cold season emissions dominate the Arctic tundra methane budget. Proceedings of the National Academy of Sciences of the United States of America 113(1): 40–45. doi:10.1073/pnas.1516017113. Zona, D., W. Oechel, C. E. Miller, S. J. Dinardo, R. Commane, J. O. W. Lindaas, R. Y-W. Chang, S. C. Wofsy, C. Sweeney, and A. Karion. 2015. CARVE-ARCSS: Methane Loss From Arctic-Fluxes From the Alaskan North Slope, 2012–2014. ORNL DAAC, Oak Ridge, TN, USA. doi:10.3334/ORNLDAAC/1300.